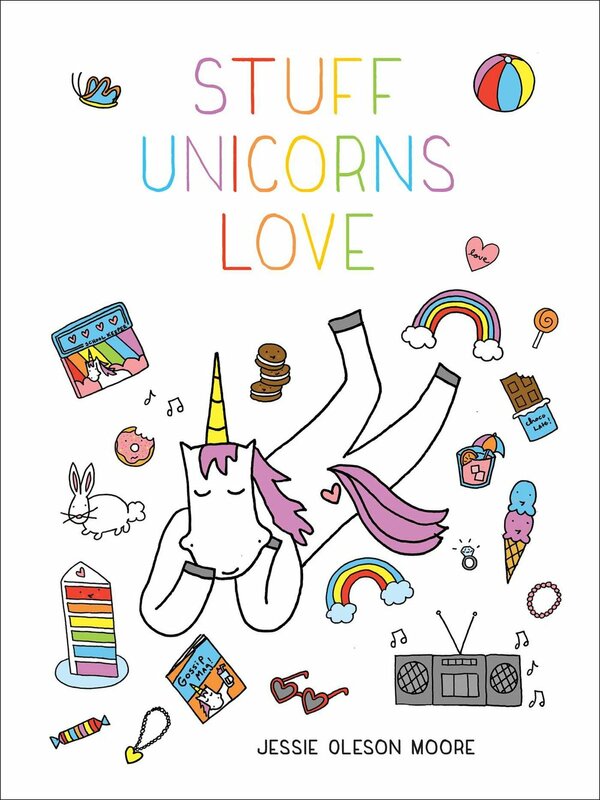 You know those little ad words that google oh so sweetly places at the top of your email browser? 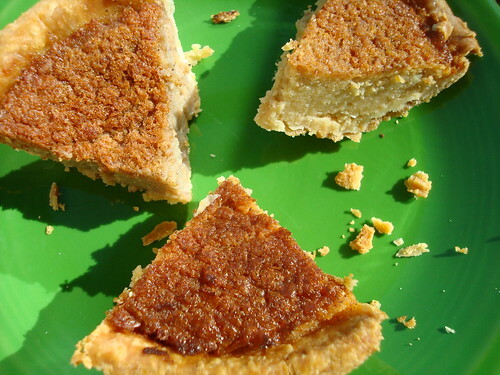 Well, recently one of those intrigued us, because it was for a type of baked good we'd never heard of before: the navy bean pie. 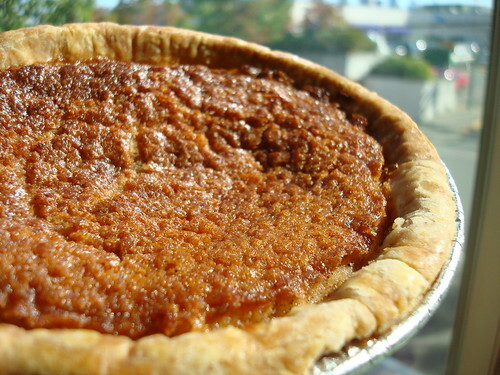 Now, upon first thought the idea of a navy bean pie isn't necessarily attractive, but then again, when you really think about it, does "sweet potato pie" or "zucchini cake" really sound delicious at first? So, we decided to give these bean pies a try. 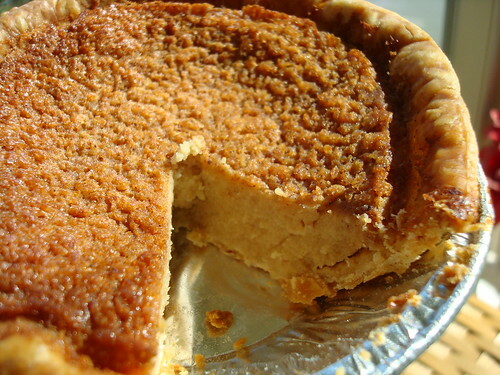 The Bean Pie was introduced in America around 1930 in the community known as Black Bottom Detroit, the Black community. It was originally formulated as a healthy alternative for sweet potato pie." Now, while the Nation of Islam movement (and the pies) seem to have roots in Detroit, we first encountered the pies through Sister Nadine's, which is based in Boston (if you're interested in their story, read about it here.) Cakespy Note: We feel we should give them props for packaging the pies very securely; they and arrived in Seattle in perfect condition. OK, and so now that you're educated, how did they taste? First we tried the "Original" bean pie. 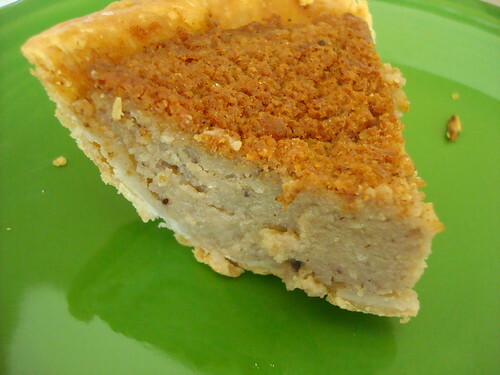 The texture was on par with that of a pumpkin pie, slightly custardy and not overly sweet; surprisingly, the beans did not lend any grittiness to the chewing process--had we not known that these were bean pies, we might not have known what they were (but of course, that would not have stopped us from continuing to eat it). We ate ours plain, but bet it would attain a few degrees of additional deliciousness if paired with vanilla ice cream or a thick layer of whipped cream. The second one we tried was the Blueberry bean pie. We thought this was a strange flavor, but it was ultimately rewarding--the blueberries were the first taste that hit the palate; as Mr. Cakespy put it, if this pie could speak, it would say "Hi, my name is blueberry...and this is my pie". 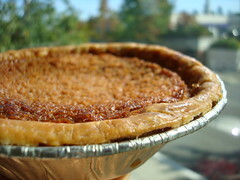 This sweet initial taste, paired with a more substantive bite of the bean filling, made it an unusual, but addictive, pie. Of all of them, this was probably our favorite. Finally, we went for the banana bean pie. Once again, it was an unusual flavor combination, but somehow it worked. The banana didn't necessarily hit you right away--it was more of a complement than a contrast to the bean filling, and the flavors sort of, if you'll allow us to be poetic for a moment, well, blossomed inside of the mouth. Paired with the substantive crust, these reminded us fleetingly of banana pakoras (but of course, baked, not fried). Overall, a very nice pie for banana fans. All things considered? Our investment was well worth it--we were happy to discover a new baked good, and rewarded to find them delicious. They're definitely a more substantial dessert, but a very tasty one too--the perfect addition to a fall baking repertoire. 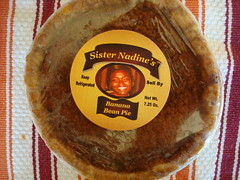 To buy Sister Nadine's bean pies, visit sisternadines.com; if you want to try your own, why not give this recipe a whirl?